EK is a 31 y/o athletic officer at one of the nation’s military academies who sustained a tear in his ACL. He opted for a non-surgical therapy. EK underwent post stem cell therapy MRI of the knee which is presented below. There is significant improvement clinically which corresponds with the improvement seen on MRI. 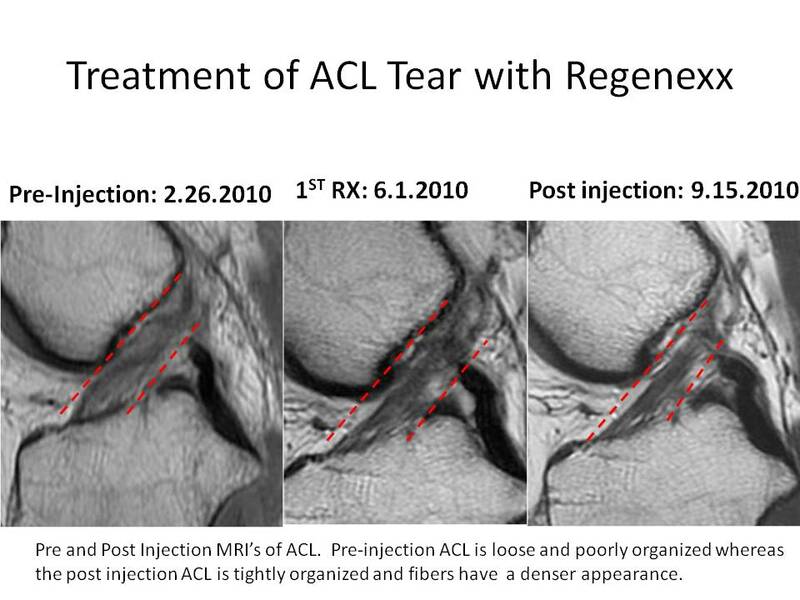 In the pre-injection MRI, the ACL is loosely organized and loose whereas after stem cell therapy utilizing the Regenexx procedure, the ACL is tightly organized and the fibers have a denser appearance. The ACL is identified with dashed red line. At the Centeno-Schultz Clinic different regenerative therapies are available which allow patients non surgical options for common orthopedic injuries. Therapies include prolotherapy, PRP, platelet derived growth factors and expanded mesenchymal stem cells. Thank you for taking the time to read the blog. Regenerative medicine has arrived.